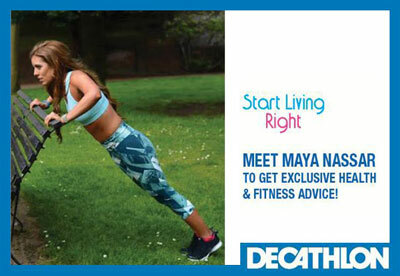 I’m really excited to announce that I’m the new brand ambassador of Decathlon Lebanon. Decathlon sells a wide range of affordable sports clothing, equipment, accessories and pretty much everything for all ages! The store is massive and definitely worth checking out. On the other hand, you can also win free personal training sessions with me when you participate in the raffle at the Animals Lebanon gala dinner taking place on Monday June 8th. I usually don’t offer private training, so this will be a one-time offer! Animals Lebanon is the largest animal welfare NGO in the Middle East and this is going to be one hell of a night! The event will take place in the rooftop club White and the night will feature dinner, drinks, entertainment and a fun party. You will also get the chance to win some amazing prizes. Starting ticket prices for the gala dinner are as little as $60! To book your tickets, call 01751678. If you have any questions just leave a comment!